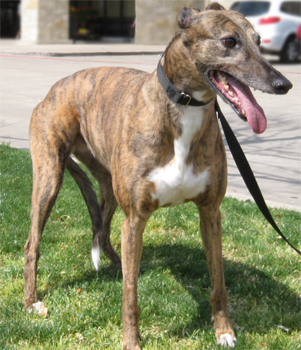 Sophie, aka Ale Santa Cruz, is a beautiful 7-year-old brindle female born May 11, 2004. Her sire is Craigie Whistler, making her grand sire the late famous Molotov, and her dam is Odd Report. There are no races to Sophie's credit on Greyhound-data.com. Sophie was in a home for several years with Brady. The previous adopter had to move, and the adoption group Sophie was originally from is no longer in business. 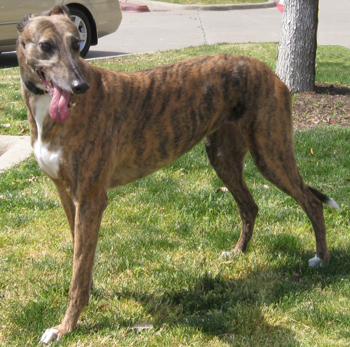 A good Samaritan took both greyhounds into her home, but was not in a position to keep them. So GALT was asked to take Sophie and Brady into our family. Sophie is enjoying the company of other greyhounds in her foster home. It is not known at this time if Sophie is small animal or cat tolerant.